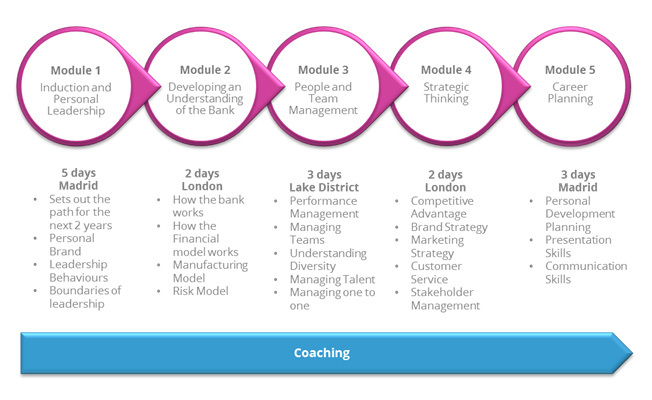 In partnership with Santander, Dove Nest Group designed and are now delivering a two tier Early in Career Programme. The programme covers two populations: Graduates and Future Leaders. Graduates work toward ILM Level 3 in Leadership and Management and Future Leaders to ILM Level 7 in Strategic Leadership. The programme addresses the behavioural and the soft skill development needs of the Graduates and is delivered very much in partnership with the Santander. The programme complements the more technical, commercial and bank specific training that the Graduates require. The modules are very interactive with exercises, role plays and case studies to explore the applicability of the concepts and models discussed to the Graduates’ current and future roles. The ‘top talent’ within the Graduate population are nominated for selection on to the Future Leader Programme. Following nomination Graduates complete a telephone competency interview, online psychometrics and a development centre. This year five Graduates were successful and are now on the Future Leader Programme. The 24 month programme is an accelerated learning journey and participants complete an ILM Level 7 award in Strategic Leadership. 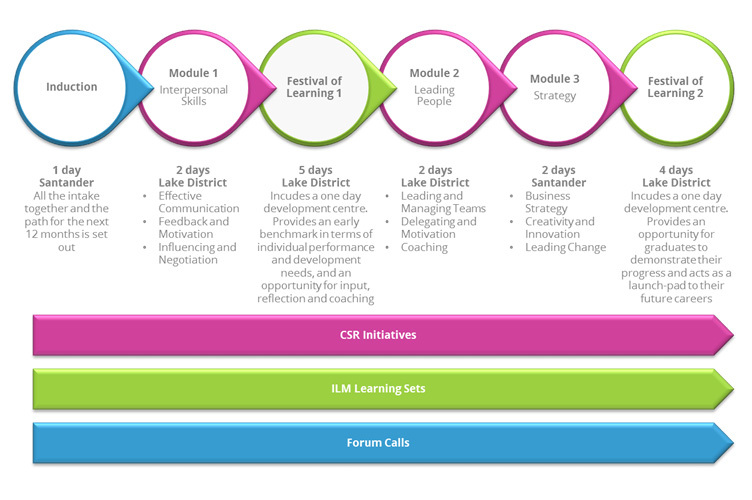 Modules are held in Madrid, London and Cumbria.